We had a blast at Office2.0 Conference last week – a very classy conference. Bravo, Ismael! While Wade attended sessions and meetings, I spent most of my time around the demo pot area where every station has a new iMac and an external 19″ flat panel displays used for logo and mounted on arms clamped to the table. No setup required – that worked out very well. Of course, there is the traffic: we met a lot of people and had many great conversations. 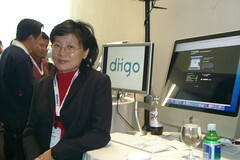 It is especially awesome to have people come up and introduce themselves as Diigo users. Thanks for stopping by. Very sweet to see more and more Diigo fans out there and we’re meeting you in person. I notice that in his IM customized signature he wrote: “every complaint is really a wish”. I think it sums up our team’s spirit quite well – it’s important that we constantly stay in tune with our users, as we are trying to listen and embrace our users’ input, and driving ourselves hard to create a super awesome service that delivers innovations, good user experience and value to them.